Fans of the legendary Broadway musical A Chorus Line will recall the song and lyric line announcing that, “Everything is beautiful At the Ballet.” That may never have been truer than at the recent opening night of the Houston Ballet’s opulent production of THE MERRY WIDOW. Adapted by John Lanchbery from the beautiful music of Franz Lehár’s operetta, it was clear from the opening curtain that Music Director, Ermanno Florio, continues to be the perfect choice to conduct the superb Houston Symphony Orchestra. With the oversight of Artistic Director, Stanton Welch, the lavish scenic and costume designs of Roberta Guidi di Bagno, the shimmering lighting designs of Randall G. Chiarelli, and the eye-popping choreography of Ronald Hynd, it is no surprise that opulence would be the order of the evening for this skillful ballet staging by Mr. Hynd and John Meehan. 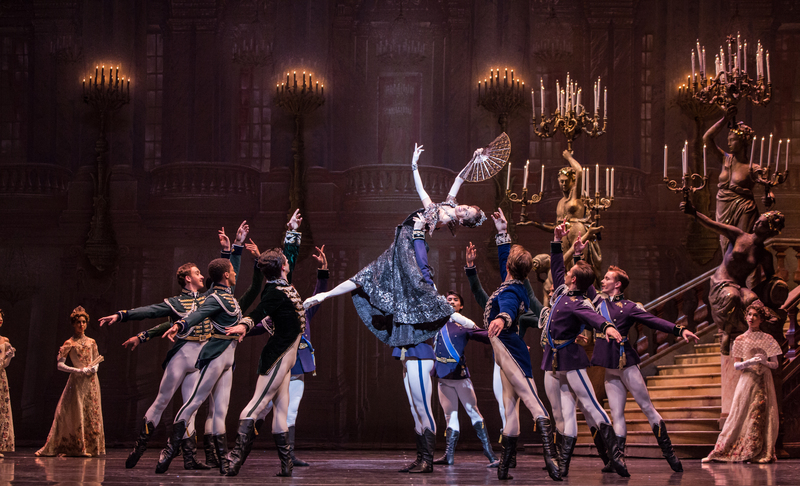 Towering above all would be the magnificent performances of this corps de ballet and the brilliant featured dancers who lead the charge in this amusing tale of courtly intrigue in the Paris of 1905. At the Pontevedrian Embassy a grand ball is scheduled for that very evening. Meanwhile, embassy officials are clamoring for a solution to the financial chaos facing the nation. (Sound familiar?) These officials include French attaché, Camille de Rosillion (Connor Walsh), and the Ambassador’s secretary, Njegus (Rhodes Elliot) with amusing choreography as these officials plow through their bureaucratic paperwork in a kind of comically synchronized assembly line. The ambassador, elderly Baron Zeta (Christopher Coomer), enters the scene accompanied by his youthful wife, Valencienne (Melody Mennite). They bring the news that a wealthy Pontevedrian widow named Hanna (Mireille Hassenboehler), will be in attendance at the ball. Hanna’s fortune is considered critical to the financial stability of Pontevedro, and it is thought that a marriage to Count Danilo (Linnar Looris) would prevent her wealth from moving elsewhere through marriage to a foreigner. With these initial plot lines extending to assorted romantic relationships that offer a lighthearted showcase for the splendid dancing of these central characters, what kinds of visual delights await future audiences? En Pointe grace abounds from the moment elegant Principal Dancer, Miss Mennite, glides on stage as Valencienne, adorned in sparkling jewels and a delicate peach gown that moves as gracefully as she. 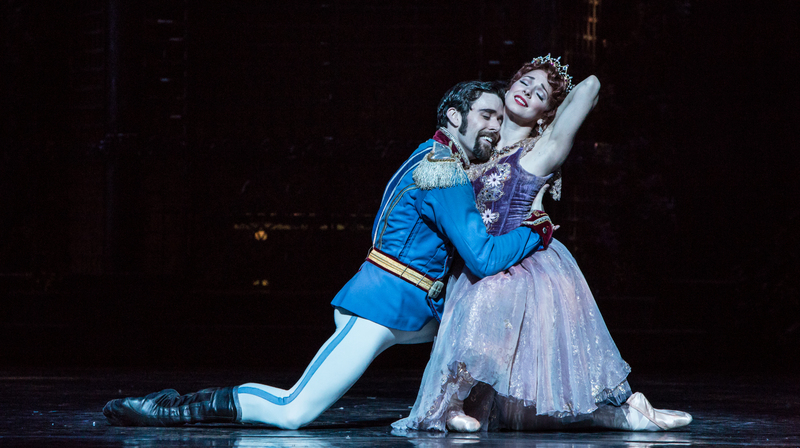 Though married to the Baron, there is a lusty, prancing and whirling sweetness in her playful flirtations with handsome Principal Dancer, Mr. Walsh as Camille. The two dance divinely, with elegant accents from the polished corps de ballet. Then there is the cleverly accomplished drunken romp from the arriving Danilo as Mr. Looris shows his skill for both comedy and dance. Hanna arrives in glittering black gown and jewels that are anything but widow-somber. 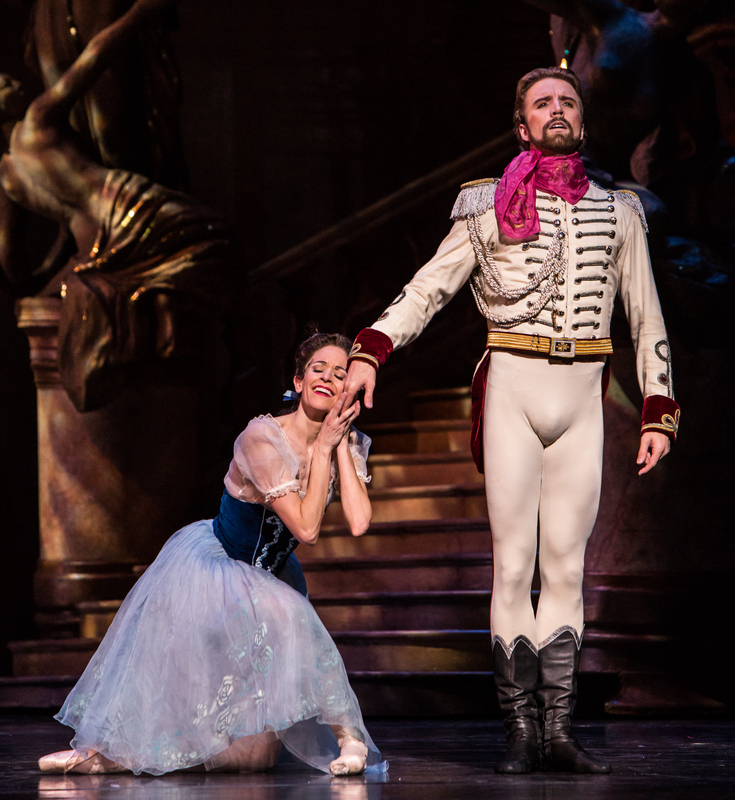 It is Principal Dancer, Ms. Hassenboehler, now at the beginning of her third decade with the company, whose imminent retirement is receiving such deserved recognition. Here, as the dancing in the ballroom explodes with grandeur, she has on full display the breathtaking talent that has made her a treasure with this company. At one point, with her back to the audience, she glided across the floor so smoothly en pointe that I overheard a woman seated near me saying, “She looks like a floating apparition!” There were times in this First Act that the ensemble seemed an orbiting and rapid-fire circle of adoration around Hanna, and there were moments when one could easily call to mind the memorable spinning and frenzied waltz in the classic film “Madame Bovary.” The ballroom’s soaring marble columns, and the grand staircase with its massive statues and flickering candelabras all add to the splendor of the elegant dance designs that close Act I with patterns that would have made filmmaker, Busby Berkeley proud. Opening under a full moon in a charming garden with lovely gazebo, Act II continues both the relationship intrigues and the dance delights as the many guests at Hanna’s villa demonstrate their various national dances in an atmosphere as merry as the melodic music. First the rugged men entertain in acrobatic style, and then the women offer contrast with a synchronized and swan-like grace. The two groups then weave together like a tapestry before a triumphant Hassenboehler delivers a brilliant solo turn from Hanna. Before the act ends there is another romantic and sensuous dance pairing from Camille and Valencienne in the brilliant hands of Walsh and Mennite. Dance gaiety seemed to peak as Act III opened in Chez Maxim with black tie elegance for all, including top hats for the gents and chic feathered hats for the ladies. Dazzling Can-Can dancers arrive in costumes of flaming orange just as hot as the daring dancing. There is a saucy turn from Valencienne and a prancing, high-kicking segment from the ensemble that might have been performed by thoroughbreds. What next seemed to be a Can-Can carousel was yet another visual delight from the stunning choreography. Hanna enters this scene in a remarkable and silvery Cinderella gown that appeared to be part feathers, part cobwebs and part snowflakes. There follows a kind of subtle Terpsichore tryst between the Baron, Valencienne and Camille as the Baron tries to come to terms with his wife’s infidelity. On a much happier note, Danilo and Hanna at last embrace, and as the lush music of the “Merry Widow Waltz” wraps its arms around us, they dance away, champagne glasses in hand. A champagne toast was very much in order for such an elegant production and the departure of such a great lady of the ballet. 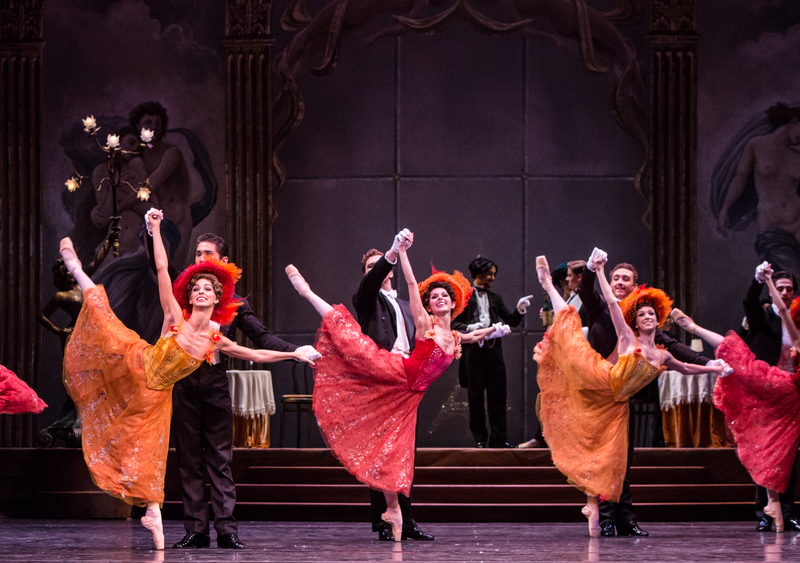 THE MERRY WIDOW continues with performances this Friday and Saturday at 7:30 pm, and this Saturday and Sunday at 2 pm, all at the Brown Theatre of the Wortham Center . For tickets and information call 800-828-ARTS, 713-227-ARTS, or visit the website at www.houstonballet.org. This entry was posted in Dance Reviews, HERE Lifestyle & Entertainment, Houston Community Newspapers online, The Courier Columns, The Merry Widow, The Villager Columns, ThePeoplesCritic.com, YourHoustonNews.com and tagged Ballet, Dance, Houston Ballet, The Merry Widow. Bookmark the permalink.